​Some children with learning disabilities started school late this year due to local authority delays in processing their education and health care plans. This will be made illegal in April, but that doesn't necessarily mean it will stop happening. I have been through the process of applying for, working through and being granted an Education, Health and Care Plan (EHCP) for my child (Audrey, pictured above). From what I’ve read and heard from other parents, we had an easy ride. We had a hard-working, thorough and extremely pleasant contact from PRESENS (pre-school special educational needs service) and he basically took control and coordinated most of what needed to happen for my daughter. "As a parent, getting into negative thinking about your own child (one you are always encouraging) can be hard, but even harder is listening to professionals discussing your child in this negative way. Using terms like 'severe delay' and comparing them to typical peers - it’s tough going at times." We seemed to prepare very far in advance, as I met other families in the SEN (special educational needs) community who had no idea when their EHCP might start, even though their child was older than mine. Audrey is now 4 and she was about 2 when she was first visited for an assessment. To describe the process: for us, it was much like the Disability Living Allowance process; filling out a very long form with details of what your child can’t do. As a parent, getting into negative thinking about your own child (one you are always encouraging) can be hard, but even harder is listening to professionals discussing your child in this negative way. Using terms like “severe delay” and comparing them to typical peers - it’s tough going at times. Everyone sits around at a meeting and has a chance to add to this document that aims to assess your child’s additional needs and grant support accordingly. It is a legally binding document and the setting (nursery, pre-school or school) have to adhere to the provisions as they are laid out. "All any parent wants (SEND or typical), is for their child to learn, enjoy and progress at school. For many typical children this just happens by their mere presence, but a child with SEND may need so much more in order to thrive." For us, it felt quite straight forward, as my daughter already receives 1:1 support in her setting, has regular visits from SaLT (speech and language therapy team), had physiotherapy support when needed, as well as a specialist health visitor and paediatrician; everyone was already working with her to achieve. The EHCP just felt like we’d finally brought together everyone’s notes and made it a legal document that had to be stuck to. Not everyone is this lucky and I recognise that there is a budget attached to her 1:1 support, so it would be feasible that in some cases, EHCPs don’t offer all that they should to save money. If it’s thought a child might ‘get by’, then corners could be cut or worse still, the whole process is dragged out so that children aren’t being granted the EHCP that they so badly need. I had felt that my input into our EHCP was lazy - I just had to answer some questions in a meeting and write some notes up. I had to review the final document that I could query or contest, but it all read fine to me. I realise now that had it not have been running smoothly, had the report not have provided what I felt my daughter needed, well then I would have had something to say. I would never have ‘lazily’ sat by and let this report pass without ensuring that my child had the best chance at an education - the best chance to thrive. All any parent wants (SEND or typical), is for their child to learn, enjoy and progress at school. For many typical children this just happens by their mere presence, but a child with SEND may need so much more in order to thrive. It’s only when spending time talking to childcare and SEND professionals that I realised some of the not-so-obvious special needs of my own child. 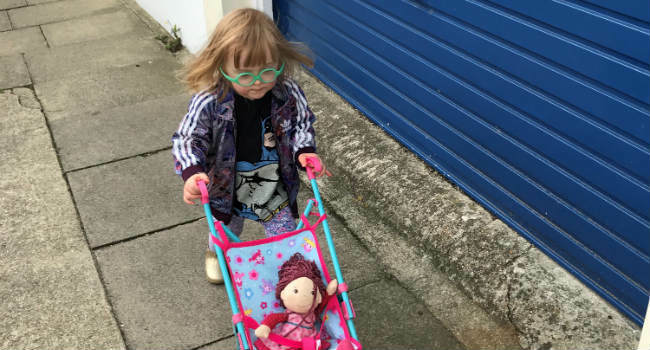 The obvious needs are things like help climbing a large step, assistance with fine motor skills, use of Makaton to help her understand… but aside from this, she needs encouragement to interact with her peers. She needs encouragement to take part in tasks she might otherwise shy away from - these are just two examples but in a day to day educational setting without someone remembering this minor things, she could just be let behind, having a plastic tea party on her own in the corner and not learning about shapes with the group of noisy children over the other side of the room. At this stage we are a little unique in that the EHCP is in place at nursery (due to our choice to defer) and I’ll be interested to see how the document changes for the school setting. I have already been privy (via social media) to a situation I can only describe as a debacle, with a child a year older than mine who’s ECHP was far from being adhered to - his 1:1 was being shared by another child(!) and he was excluded from an after-school club (before even attending) as the school felt he 'wouldn't cope'. Needless to say the mother involved did her research and the school have apologised and are now reviewing their inclusion policy. My advice therefore to anyone starting this process, or finding themselves buried in it - read things thoroughly, do your research and don't be afraid to fight for your rights. Every child deserves to thrive and those with SEND simply do need someone fighting their corner in order to do this.